We must now proceed in due order to consider that virtue which is more nearly related to piety, being as it were a sister, a twin sister, namely, humanity, which the father of our laws (Moses) loved so much that I know not if any human being was ever more attached to it. (Philo, 1st century AD). But who is set up for the impossible that is going to happen? Who is set up for tragedy and the incomprehensibility of suffering? Nobody. The tragedy of the man not set up for tragedy — that is every man’s tragedy. (Philip Roth: American Pastoral). Clearly the theme for the day, established by 11am, was ‘humanity’. Humanity is, after all, what literature has to offer us. All those stories of all those human beings, meeting things we may meet, things we hope never to meet. And so to the RA. What, people have been asking, can they possibly do to follow the David Hockney exhibition? 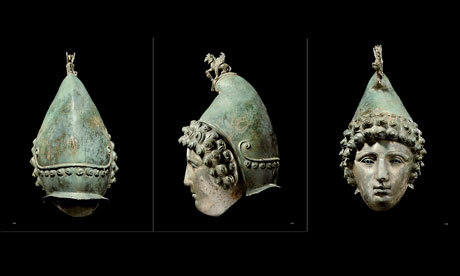 Here’s the answer – a display of bronzes throughout time and culture. Almost at once I was baffled by the arrangement. 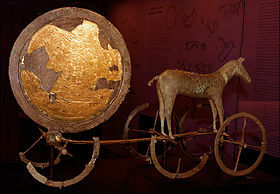 Where was the usual tour beginning in misty antiquity, going through the classical world, medieval Europe, Renaissance, the Boring Age to our own denatured times? Everything was muddled up and arranged according to broad categories: Gods, Heads, Objects. It was like the Pitt Rivers Museum here in Oxford, where you can find Eskimo lace next to Welsh Miner’s whalebone carvings. It’s completely creative to have all your anticipations deconstructed. You are freed to see anew and to spot the preposterous judgements in yourself even as they arise: ‘Good heavens, they could do this in the fourth millennium BC?’ (Naughty RA to succumb to the PC requirement that we rename our eras BCE and CE). It soon becomes evident that we have been capable of great art since the beginning and, further, that there is almost nothing between ancient and modern. It is all the same brilliance and genius. There is one difference however. When it comes to contemporary art, such as beer cans or a football in bronze, something changes. It’s as if all the spirit has been sucked out of art. What will they think of us when they look back on our secular materialist age? ‘They will marvel,’ said my companion, Darby Costello, who came up with the phrase ‘secular materialist’, ‘at all we have achieved without gods.’ Anyway such objects, from Remington’s cowboys to Koon’s football, did allow us to pass by and breathe a little, for almost everything else was utterly captivating. The Greek head of a horse, 400 BC, which spent some of its long life in the garden of Lorenzo de’ Medici (why didn’t I know that?). 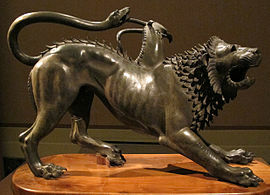 Bronze cast copy of Cellini’s Perseus and Medusa from Florence. Huge and enthralling – even the shadows it casts on the wall are wonderful. The Shadow of Evening, Etruscan from Volterra. This statuette had inspired a scene on shadows in Volterra in A Tabernacle for the Sun. The day I heard my first novel had been accepted for publication (by Allison and Busby), a friend advised me to go out and buy myself a present. I went to the Ashmolean and what should I find in the gift shop but a little figurine of Shadow. So wonderful to see it in its bronzey flesh again. A father with his three year old son on his shoulders. They are standing in front of il Porcellino, the great bronze boar from il Mercato Vecchio, Florence, its snout rubbed smooth by generations of superstitious hands. It sits – as I had never noticed before – in front of a pool made of a mirror, in a little bronze landscape of grasses and plants filled with creepy crawlies. Father and son were identifying snakes, toads, frogs. From a short distance, I watched the little boy engaging with art and knew I was seeing something truly magnificent that I cannot put into words. On the way home I saw the headline ‘Now it is a murder hunt’ and my heart plunged like a lift whose cables have been cut in grief for that family suffering what must be so close to unendurable. Who is set up for tragedy and the incomprehensibility of suffering? Nobody. I got home expecting to hear that little April’s body has been found, but not so, they have just stopped looking for a living five year old and are looking under the earth rather than on top of it. 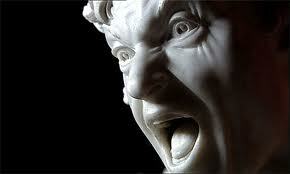 One of the more uncomfortable exhibits was Bernini’s The Damned Soul which features on the poster. A face contorted by the horror it must endure forever is not easy to look at. Ian Hislop’s programme on The Stiff Upper Lip – An Emotional History of Britain – began last evening and was very disappointing. After a run-through of history of the 18th Century (prior to which, apparently, we were all quite jolly), he finally alighted on the Duke of Wellington as ‘the cause’ of our famous stoicism. It struck me as a very superficial understanding of history and human psychology. No one causes anything. The Iron Duke – the original stiff upper lip? Princess Diana didn’t teach me how to cry, or tell me I was free to. The so-called ‘Queen of Hearts’ was completely neutral in the process of this nation learning to express its emotions (if that’s what that episode of mass hysteria was). In his essay on history which Tolstoy appends to War and Peace, he likens Napoleon to the figurehead on a great ship. The figurehead may have the illusion of being a leader but it is merely being pushed by the ship, the people. To which I would add that the people are being pushed by the wind. Analyzing national traits in historical personages is to ignore the concept of zeitgeist, the defining spirit or mood of an age. Who knows what it is, whence it bloweth and where it listeth. I was going up to bed troubled until I remembered an occasion in my own life when I felt part of a mass, if not national, change. It was 1967 and I was 17 coming on 18. I’d gone to Cornwall with my friend Sue. We were dressed as mods, believed we were mods, and were in search of a bit of surfing action. One day, up on the rocks above Newquay Beach, we were listening to Radio Caroline on our transistor radio. The beach was full of people listening to trannies tuned to various stations. It was the usual cacophony we suffered before they invented headphones. Everyone, hundreds and hundreds of people in one sandy bay singing the same song, with words so powerful that they did as they said. For that moment of palpable unity, me and Sue, we believed it. This was true. Love is all that is needed for there to be peace and well-being. Tra la la la laa! We had gone to Cornwall as mods but we went home as hippies. Yes, we bought bells and necklaces to make this conversion obvious to others, but the real conversion had been within. Our feckless youth was behind us, frivolous sports a thing of the past. There was a world beyond Cornwall, beyond Britain, even, and suddenly we belonged to it. Did The Beatles cause the zeitgeist? No, they just put it into words and music. It came to be called the Summer of Love, but we knew it as such in the moment on that beach at Newquay. I’m sure this is how national change takes place: in the hearts and minds of many, at once, without anyone orchestrating or influencing it. Hislop, with his National Portrait Gallery view of history, is paddling in the shallows. ‘Critical mass’, that term taken from nuclear physics, in sociology means ‘a threshold value of the number of people needed to trigger a phenomenon by exchange of ideas.’ I find that a useful concept. We all feel the same but it’s mute and unformulated until the number of us is so large that our company includes someone who can speak out – or sing out – for the many. And then the balance tips. 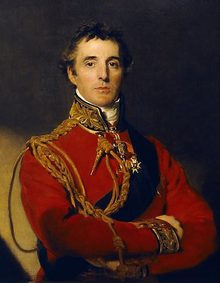 I don’t know where our stiff upper lip came from but it would be far more fruitful to have a look at the Duke of Wellington’s schooling and his relationship to his father than his tomb in Westminster Abbey. Or to look at the social conditions for all classes around the time of the Napoleonic Wars, to find the misery which made us, acting as one, choose to keep calm and carry on. Hislop’s programme is worth watching, because it’s thought provoking, but it left a nasty aftertaste of history education in the 1950s, which consisted of kings and dukes and a few rebels, as if, between them, they constituted history. They do not. Who knows what does? And the big question bothering us at the moment is whether the London Olympics changed the mood of the nation or was just a load of hype dressed up in disturbingly inverted symbolism and some pretty weird numerology. For which see the brilliant article by Richard Ramsbotham in the current issue of New View.